With the controversial Trans-Pacific Partnership free trade deal apparently stopped, advocates are urging members of Congress to keep up the pressure for agreements that raise standards for all workers and are negotiated in an open, transparent process. On Tuesday, they took that message to U.S. Senator Amy Klobuchar, who had been silent on how she might have voted if the TPP were proposed during the current lame duck session of Congress. Members of several organizations that have long worked on globalization issues met with Ben Hill, Klobuchar’s state director, at Klobuchar’s Minneapolis office. What was to have been a large rally morphed into a smaller meeting after word came from Washington, D.C., that TPP would not come to a vote. The group, led by Ben Anderson of the Land Stewardship Project, urged Klobuchar to speak out more forcefully. They presented petitions with thousands of signatures from Minnesotans who oppose backroom trade deals. “While the TPP may be dead, the process [of negotiating trade] is still severely broken,” said Josh Wise of the Institute for Agriculture and Trade Policy. 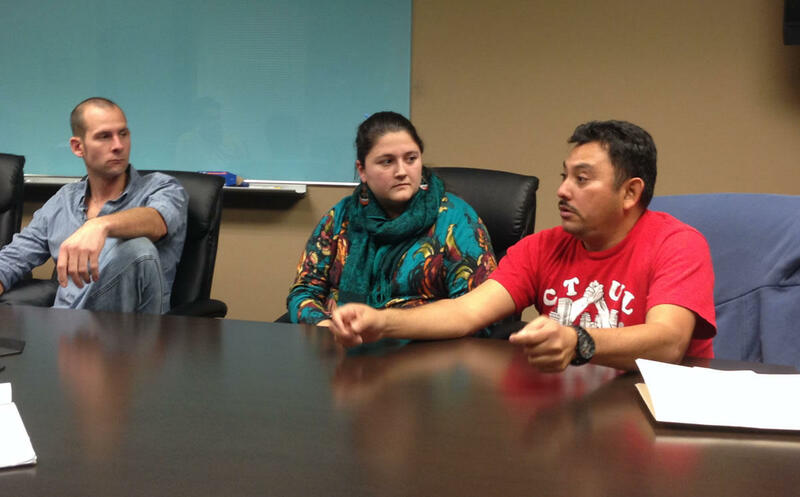 Other participants in the meeting included representatives of CTUL, Centro de Trabajadores Unidos en la Lucha/Center of Workers United in Struggle; Minnesota Fair Trade Coalition; Minnesota Nurses Association and the Sierra Club. The TPP would have involved 12 Pacific Rim nations, including the United States, and would have set binding rules governing approximately 40 percent of the global economy. The United States formally entered into negotiations on the deal in February 2008 and announced last year that an agreement had been reached. The deal has been criticized for lacking meaningful provisions to protect workers, human rights and the environment and for potentially reducing access to life-saving medicines. The TPP, like all trade agreements starting with NAFTA in the early 1990s, was negotiated in secret with corporations – but not citizens – having a seat at the table. “Some of the provisions, such as corporate superiority over the laws of other nations, are horrifying,” said Jon Tollefson of the Minnesota Nurses Association. While Donald Trump campaigned against the TPP, it is unclear what his administration will do regarding trade – particularly as it regards the negotiations process. Hill promised to convey the group’s concerns to Klobuchar. Meanwhile, the national Citizens Trade Campaign, a coalition of many groups advocating for fair trade, held a national call-in day Tuesday to ensure the TPP is dead. “Now that we're so close to defeating it, we need to ensure that not only is the TPP abandoned forever — but also the entire model it's built upon,” Executive Director Arthur Stamoulis said. “Defeating the TPP for good will be a historic victory for the cross-sector, international peoples' movements that have been fighting it” for many years.